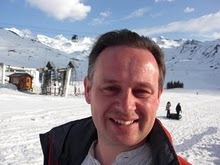 It’s been a while since I did a data driven blog post, so here I am with one on the “Board of Longitude”. The board was established by act of parliament in 1714 with a headline prize of £20,000 to anyone who discovered a method to determine the longitude at sea to within 30 nautical miles. The members of the Board also had discretion to make smaller awards of up to £2,000 in support of proposals which they thought had merit. The Board was finally wound up in 1828, 114 years after its formation. The latitude is your location in the North-South direction between the equator and either of the earth’s poles, it is easily determined by the position of the sun or stars above the horizon, and we shall speak no more of it here. The longitude is the second piece of information required to specify ones position on the surface of the earth and is a measure your location East-West relative to the Greenwich meridian. The earth turns at a fixed rate and as it does the sun appears to move through the sky. You can use this behaviour to fix a local noon time: the time at which the sun reaches the highest point in the sky. If, when you measure your local noon, you can also determine what time it is at some reference point Greenwich, for example, then you can find your longitude from the difference between the two times. The threshold for the highest Longitude award amounts to knowing the time at Greenwich to within 2 minutes, wherever you are in the world, and however you got there. This was a serious restriction at the time, because a journey to anywhere in the world could have taken months of voyaging at sea with its concomitant vibrations and extremes of temperature, pressure and humidity all of which have serious implications for precision timekeeping devices. The Board of Longitude intertwines with various of the people whose biographies I’ve read, and surveying efforts taking place during the 18th and 19th centuries. It made a walk on appearance in Tim Harford’s Adapt, which I’ve just read, as an early example of prizes being offered to solve scientific problems. Below I present data on the awards made by the Board during its existence from 1714 to 1828. The data I have used is from “Britain’s Board of Longitude: The Finances, 1714-1828” By Derek Howse1 which I reached via The Board of Longitude Project based at the Royal Museums at Greenwich. 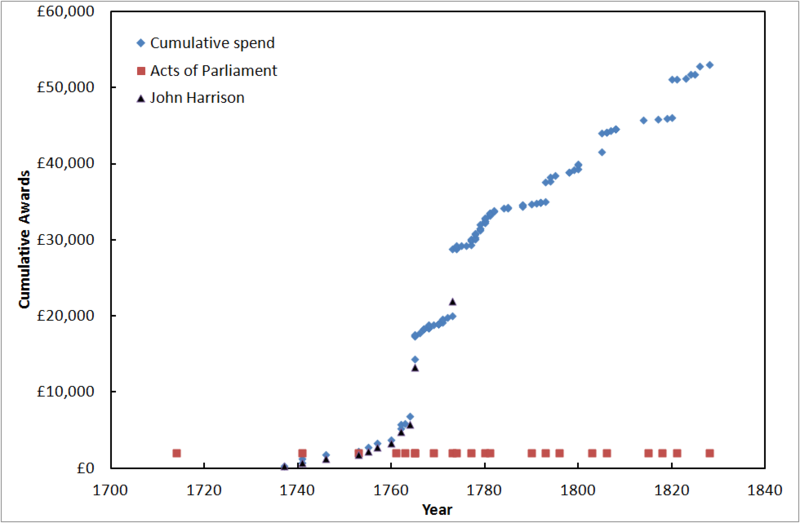 The chart below shows the cumulative total of the awards made by the Board (blue diamonds), awards made to John Harrison who won the central prize of the original Board (black triangles) and the dates of Acts of Parliament relating to the Board (red squares). Values are presented as at the time they were awarded, the modern equivalent values are debatable but the original £20,000 award is said to have been worth between £1million and £3.5million in modern terms, so a rule of thumb would be to multiple by 100 to get approximate modern values. Although established in 1714, the Board made no reward until 1737 and until 1765 made the great majority of awards to John Harrison for his work on clocks; clockmakers Thomas Earnshaw (1800, 1805), Thomas Mudge (1777,1793) and John Arnold (father and son 1771-1805) also received significant sums from the Board. A second area of awards was in the “lunar” method of determining the longitude which uses the positions of stars relative to the moon to determine time and hence longitude. The widow of Tobias Mayer received the largest award, £3,000, for work in this area. The list of awardees contains a number of famous European mathematicians including Leonhard Euler, Friedrich Bessel, and Johann Bernoulli. After 1763 the Board started to branch out, having been mandated by parliament to prepare and print almanacs containing astronomical information. In the twilight of its years the Board gained responsibility for awards relating to the discovery of the North-West passage (a sea route from the Atlantic to the Pacific via the north of Canada), the second largest recipient of awards for the whole period were the crews of the Hecla and Griper of £5000 in 1820 for reaching 110oW within the Arctic Circle, pursuing this goal. The story of the Board of Longitude is often presented as a battle between the Board and John Harrison for the “big prize” but these data highlight a longer and more subtle existence with Harrison receiving support over an extended period and the Board going on to undertake a range of other activities. 1. “Britain’s Board of Longitude: The Finances, 1714-1828” By Derek Howse, The Mariner’s Mirror, Vol. 84(4), November 1998, 400-417. (pdf) Sadly the article notes that Derek Howse died after the preparation of this article. Thanks for this, Ian! It’s great to see the figures laid out like this. Of course, as you know from reading Howse’s article, the rewards were not the whole of the Board’s budget. The Harrison vs Board picture is further complicated when we look at the figures spent on publications (mostly about astronomical rather timekeeping method), other instruments, expeditions/trials and, latterly, the cost of staff overseeing Navy chronometers and Nautical Almanacs. But for me, you final paragraph gets to the nub of the issue. Without considerable support, over a long period of time, Harrison would not have been in a position to win a major reward – as government-funded R&D it is totally unique for the 18thC. Yet, despite giving out the largest reward, the issue was not solved with a single, or two or three, timekeepers. Further investment was essential to role these technologies out. Thanks again – apologies for getting on my longitude soap box! Yes, Howse’s article packs a lot in – there was also quite a significant spend on overheads! The sheer length of the enterprise is something I wanted to highlight: from first Act to the final award to Harrison is just shy of 60 years. It’s interesting that the Board managed to keep going for another 50 or so years, I guess this as a result of the issue of technology roll-out – I note that the wikipedia page for John Harrison states that initial costs for these chronometers were as much as 30% of the cost of the ship that carried them.